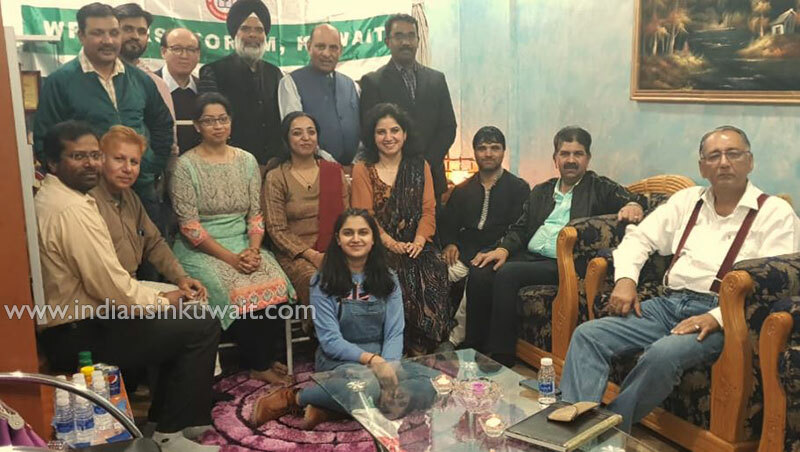 Writers’ Forum, Kuwaits’ held their monthly meeting on 23rd Nov’18 at Hawally residence of one of the members Dr. (Ms.) Radhika Bhardwaj.. Writers and poets presented their best of work on various national and social issues. Meeting was presided over by Hindi and English Poetess & writer Ms. Nazneen Ali. Mr. Faheem; the Gen. Sec of Welfare India was the chief guest of the evening while Mr. Ishtihaq & Mr. Irshad were also present among honourable guests. In addition to members, Ms. Priyanka Baranwal also attended as new member of the Forum. She is Hindi Writer and Poet and author of Hindi novels & Poetry Books. Sunil Sonsi; the Jointl Secretary of the forum conducted the proceeding. The first session of meeting, the Story/Article session began with an article ‘Wasiyat’ wherein he expressed his last will to donate his body organs to the needy persons in the society. Poetry session also opened with full enthusiasm and the poets recited their poems on social and national issues. All the members enjoyed the poems recited by the Hindi poets; Mr. Umesh Sharma, Ms. Dr. Radhika & Ms. Priyanka. The Urdu writers who made the evening vibrant included Mr. Sayeed Nazar Kadapawi & S. Qamar Minto. Mr Mohan Singh read an English poem on behalf of his daughter Parminder Kaur. Aamir Diwan who is a renowned Hindi poet presented his first English poem, Astrologer. Biggest attraction of meeting was Hindi poem GURU (Teacher) by Ms Kashish Bhardwaj; a student of class 7. Towards the conclusion of the program, the Chief guest Mr.Faheem expressed his view about the evening and appreciated the creative work of WFK and encouraged the members to continue the efforts of National Integration. President of the evening Ms Nazneen Ali read out a poem in Hindi followed by Presidential address. Members extended their thanks to host Dr. (Ms) Radhika Bhardwaj for her hospitality.